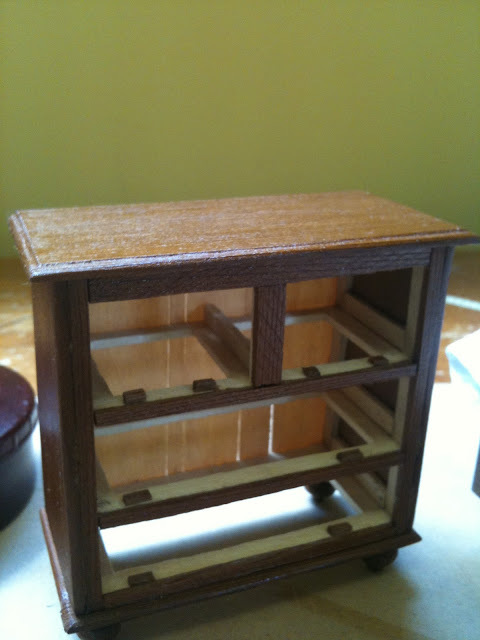 While I was working on the bathroom this weekend, my Mum (Louise) and I also put together a little fern (from a miniature kit she bought at the Melbourne miniatures show) and finished off a little dresser Louise made a little while ago. 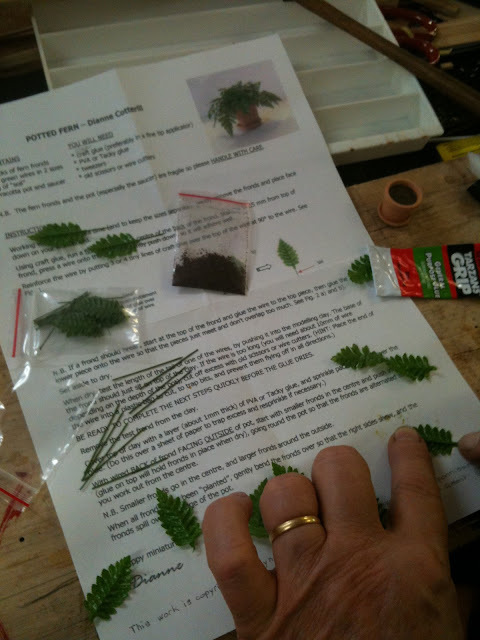 The fern kit came with good instructions, but was a bit fiddley. 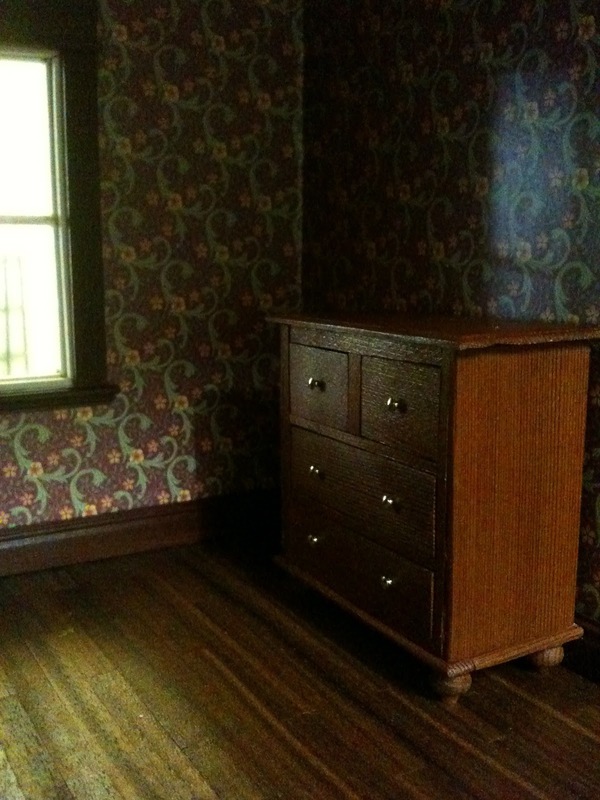 Louise's little dresser was made correctly (like a real one). Louise buys and restores old furniture, and so has a good working knowledge of their anatomy. She is also quite handy and good at tiny detail! I discovered to my joy that this little dresser went very well with the little bed we bought from McQueeney Miniatures some time ago. I began to apply the french polish to the little dresser, layer on layer. After about six coats it took on a nice sheen that I was happy with. 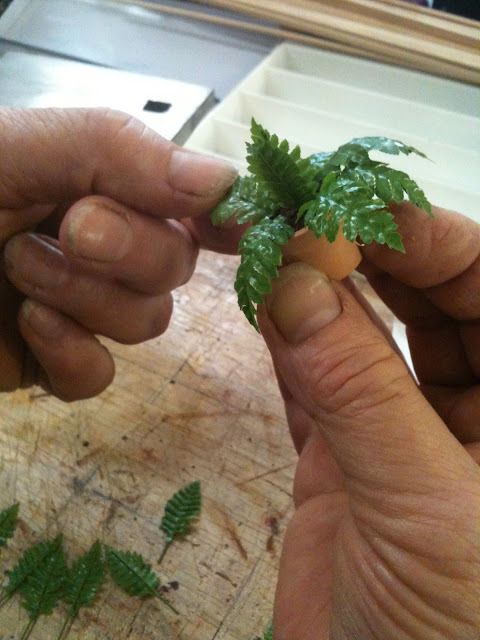 Meanwhile, Louise was finishing her fern quite nicely. I then found some little brass nobs and a tiny drill to make the finishing touches. 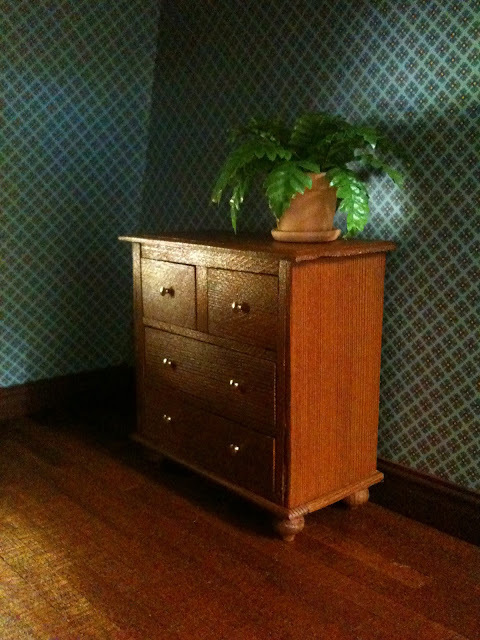 The fern and the dresser look good in the house. 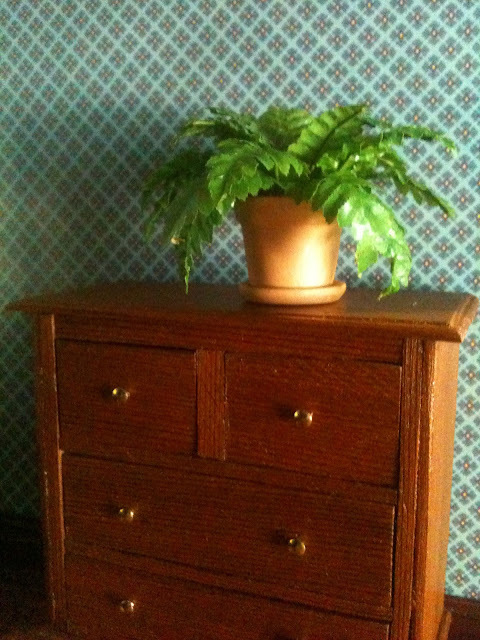 Eventually however, the fern found its rightful place in the bathroom, leaving the dresser alone to await some other as yet unfound adornments. Beautiful work on both the dresser and plant. I love your wallpaper! You both did a terrific job. I love the plant and the dresser is just a wonderful piece of mini furniture. Beautifulkly finished! Thanks Giac, glad you liked it. 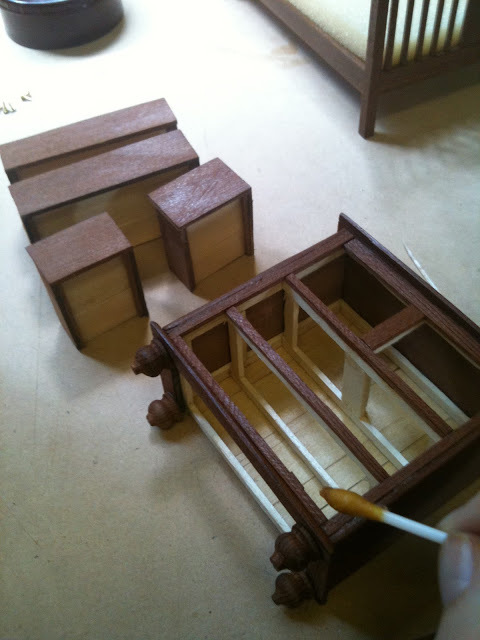 Finding good furniture can sometimes be hard - sometimes you have to make it yourself I think! Hi Emily, both are lovely and fit very well into your attic bedroom. I'd love to know where you found those little drawer knobs, they can be very hard to find small enough! I think that the knobs were just from houseworks. I got them from my local miniatures shop - so they must have come from a big supplier. It can be hard to find the best fittings I know! Thanks! Yes I was very proud of them too. I loved your flowers, and look forward to seeing more projects! Just lovely emily. They both look beautiful, the dresser was a good find and works really well with the McQueen bed. Oh thanks Fi, The McQueenie miniature kits are quite good. Have you tried any yet? I just found your blog... and I'm really glad about it! My Wallpaper has Bubbled! Help!